You are here: Home > Just how dangerous is childbirth? Just how dangerous is childbirth? Natural childbirth and homebirth advocacy are based on mistruths, half truths and outright lies. The biggest lie of all, the foundational lie of natural childbirth and homebirth, is the idea that birth is inherently safe. I’ve been writing for years that childbirth is the single most dangerous day of the 18 years of childhood. 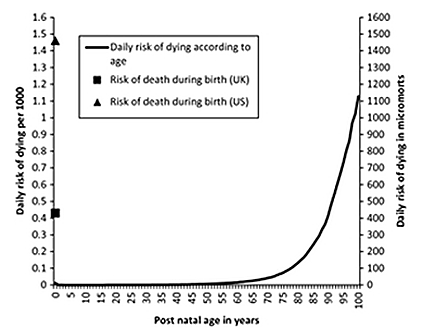 Now a new paper published in the British Journal of Obstetrics and Gynecology shows that birth isn’t simply the most dangerous day of childhood; it is the most dangerous day of a 90+ year lifespan. The paper is The dangers of the day of birth. One of the authors wrote about it at his personal blog. Much of the risk of childbirth remains concentrated in a relatively short period: the day of labour and delivery. In addition, when death occurs so early in life it results in more life years lost on average than when death occurs at an older age. We speculated that expressed on a daily risk scale, instead of as per thousand births, childbirth risks would appear very different. We aimed to calculate the risk of dying on each day of your life, and compare these risks with other activities or events that an individual may encounter. This information would then be used to calculate the loss of life expectancy sustained with death occurring on the day of birth. The risk in the US is even higher as a result of a higher rate of risk factors and a lower rate of health care access than in the UK. And that’s the risk when the baby has access to immediate life saving care. The risk at homebirth is higher still. When natural childbirth or homebirth advocates tell you to trust birth, show them the graph, and see what they have to say then. If they still tell you to trust birth, you have learned that you should never trust them. 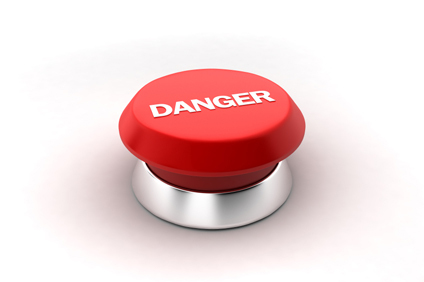 ← Childbirth: should we err on the side of caution or err on the side of risk? In addition to some brains, find some bras. Good grief. The 60’s called and they want their shirt back. OT, I was talking to my husband’s friend’s wife today and she said with her first she hired a doula and went to a CNM and was really commited to a natural birth. She said she pushed for hours and her son finally came out presenting with a shoulder and she got multiple fourth degree tears. I didn’t ask her details, but what does multiple fourth degree tears mean? Does that mean you tear up the front and back? She said it was horrific and she ended up needed a blood transfusion and the healing process was very lengthy. She waited over 7 years to have her other children and had scheduled csections. I was just cringing listening to her story! Her son was born with Congenital scoliosis, renal issues and heart problems. He had his first spinal surgery as a toddler. None of his issues were diagnosed before birth. Is that why he came out in the position he did? I was too speechless to ask her follow up questions! I’ve never met someone in person who was that injuried by a vaginally birth! A fourth degree tear goes into the rectal mucosa. I think a few regular commenters have had 4th degree tears as well. How dangerous is birth? We tend on this page to talk about the babies who die, but I know a little boy who didn’t die, but was left profoundly and permanently damaged. His mother is a lovely person but unfortunately chose a birth center birth with CPMs. I’ll leave out some of the stupider things they did, such as one bringing her OWN baby to the birth…. When he was born very depressed the midwives literally didn’t know how to resuscitate him. They finally called the EMTs who took him to the hospital where he was treated for HIE. His parents could not be nicer but because the midwives had (you guessed it!) no insurance, they and unable to sue and have no redress in the courts to get money to buy the things they need to care for this sweet, bright disabled 4 year old who will never walk. What they really need is a van to transport him in his chair but they cannot afford the $35 K price tag. Mom and Dad are very proud so some of their friends have started a gofundme to raise money for the van. Please consider donating. If everyone who reads here would give even $10 it would make a huge difference. It makes me both sad, and angry, that these idiots can kill at will, leave babies brain damaged, and they have zero consequences. The parents have no way to recoup any money, nor collect when things go wrong. These parents shouldn’t have a son with CP as it is, but to not be able to get the care and transportation he needs? Come on. Insurance is so basic, I cannot believe they get away with not having it. But then again, I cannot believe they can get away with calling themselves MW either, so I guess I shouldn’t be surprised. There needs to be a “truth in advertising” for these frauds. I wonder if parents would still choose this route if they were fully aware of the possible outcomes. Death may be the worst, but it sure isn’t the most costly, of their mistakes. I think this is something that is very important to highlight because we often here from NCBers that “there are good and bad CPM’s just like there are good and bad OB’s.” While this is technically true, you are not going to find an OB working at a hospital in the US that doesn’t know how to call for a resuscitation team. We make sure that OB’s get the education needed to recognize the need for resuscitation and that hospitals have procedures in place to make sure that a quick resus is available. CPM’s have neither the education nor the facilities for that. I can pretty much guarantee that if you give birth in the hospital and your baby need a resus the doctor isn’t going to be sitting their poking him/her in a loss for what to do. Slightly O/T: Does anyone know where I can find any articles on the dangers of maternal exhaustion during labour? I’ve noticed that a lot of NCB avocates seem to think this is something that can just be overcome with proper care during labour and ‘positive thinking’, and I’m sure those things help, but as with top athletes, a physical limit does exist and I’m interested to find out about the possible risks associated with true maternal exhaustion. It’s called LABOR for pete’s sake! I’m just guessing, but I am thinking it got called that for a reason, and not because it was like a leisurely stroll in the park. The implication from the NCB advocates is that all those people who worked during their labor (which obviously was common enough for it to be called labor in the first place) were just all doing it wrong? The quaint terms surrounding childbirth are amusing: to be in labor, Lying-In Hospital, bag of waters (always plural, no “bag of water”. Quickening. Lightening. Sounds like a frickin thunderstorm. I just scanned two pages of study results obtained using the search terms “maternal exhaustion labor”. I saw two issues with my laywoman’s eyes: 1) heart rates during labor approach those of medium and heavy exercise, which can be a problem for sedentary women, and 2) dehydration, which is not adequately alleviated by just having drinks of water. Actually, for birth #2, I think I had an IV after all. It was in Ecuador, and they weren’t much for NCB stuff at that private clinica. I will always remember the crowd of nurses gathered to watch the crazy gringa deliver without an epidural. Interestingly, that was by far my easiest labor and delivery of the first three (#4 was one of those running-red-lights-in-the-middle-of-the-night kind of events, so I’m opting for induction with #5 in about 7 weeks), even though my baby weighed 9.5 lbs and broke her collarbone as she came barreling out (it was a greenstick fracture which no one even mentioned to us till her first pediatrician visit). I’ve long wondered why that delivery was so much easier than #3, who was a pound smaller. What if it was the IV that made the difference? Grrrrrrrrrrr. I had a baby in Ecuador! They wouldn’t let me have an epidural. They said they were for c sections only. Which city? I was in Guayaquil. Cuenca. Epidurals were unheard of among my in laws, unless it was for a csection. I also know that poor women from rural areas would come in on buses to give birth in the public hospital because it was safer and they knew it. There was a coffin store I used to pass all the time that always had a tiny coffin for sale out front. Did you pay for the L&D and doctor charges/fees? If so, do you mind if I ask how much it was? Or is it all socialized and free like in Cuba? Thanks for sharing! It’s “free” for Ecuadorians, but not for foreigners, even long time legal residents married to citizens. My info is outdated, but the public hospital was no frills, and patients had to pay for all medicine and supplies. I don’t know what happened if they couldn’t pay, as I’m sure happened constantly. I suspect that access to health care for the indigent is improved now. I went to a private clinic, and we had private insurance that my OBGyn actually tried to overcharge. I think there were both private and public providers, the latter which was free for Ecuadorians and the former which was very reasonably priced by US standards and utilized by Ecuadoreans who could afford it. We had an Ecuadorian acquaintance who needed cancer treatment, and there were often not enough beds and/or medicine when he went in to the public facility and he’d be sent home without receiving needed treatment. We don’t know the final outcome of his case because we returned to the USA. Interesting that about epidurals. My doctor actually looked annoyed that I hadn’t asked for anesthesia. Guayaquil is a bigger city, though. I think the whole NCB movement is actually glorified needle-phobia. I think the same of the anti-vax movement. Stick the viruses in a pill and whack a “99% natural” label on the bottle and put it in the “supplements” area of a pharmacy/naturopath office and call it an “immune system booster” and our problems of some kids not getting vaccinations would be solved. Funny but oh so true! The other day, my friend’s five year old needed some vaccines and was a little anxious, so his dad tried to explain why vaccines are necessary. The dad told his son that vaccines are practice for your body in case you get attacked by a disease, just like martial arts lessons (which the son takes) are practice in case you ever get attacked by a bully. The kid, um, sort of got it. Now he thinks that vaccines will make him strong enough to beat up bullies. Like Spider-Man’s radioactive bite or something. Well, whatever works, I suppose. Never underestimate the magical powers of a bandaid. There is no illness they can’t cure. Especially if there are cartoon characters on them. I’m a big fan of Sid the Science kid’s special on vaccinations. It’s simple and straightforward and truthful. Even has a good song to help with the fear, which we sing every time: hey kids! Here we go! Stopping that virus, that’s our goal! So c’mon everybody, we’re gettin a shot! It might hurt a little bit (just a little bit) but it’s gonna help a whole lot! Eddie loves “Sid Kid” and loves to play that he’s giving vaccinations. He takes his shots like a champ, cries a little and moves on. I’m so proud of him, since I was an extremely needle phobic child who had to be held down by multiple people for injections. Not my boy; sitting on my lap and getting a hug and he’s all about the shot. My boys also call him “Sid Kid” and he is a huge hit in this house too. I’ve seen that episode and like it a lot. But I’ve heard some antivax backlash over it. A trip to the chocolate factory afterwards usually helps around here. IV hydration may well have saved my daughter and I from a c section. My water had been leaking for a while without me realizing it…I finally went to the hospital in early labor, regular ctx but still only 3cm, her fluid was low and she was tachycardic. IV fluids to me perked her right up (or down, in this case), and a “whiff” of pitocin augmentation ensured that we had an uneventful (but jarringly swift) delivery 3 hours later. If I had been a homebirth transfer and she had been in distress for longer, who knows what would have happened? Or would we even have known she was in distress? Probably not. Modern medicine: it’s good. What would the outcome be if, for example, a woman in labour became so exhausted that she collapsed? I’m wondering what would happen if this occured at a homebirth, vs what would happen in the hospital. What a great way to put it. Dr. Amy, may I say that in the last couple weeks, there was just one excellent post after another, each one outlining a major argument against homebirth and NBC orthodoxy? Congratulations! And thank you for all the time you put into this. It is invaluable, and there is no other place on the web that does what you do. I also want to say that in my (anecdotal) perception, I feel like it is starting to work? I have seen several discussions lately in half-crunchy circles on Facebook and the like where there were numerous voices against homebirth – much more than I would have expected! – and they were using good arguments, like those discussed here. I am quite excited about that. Natural childbirth advocates claim that birth is safe, and that the safest birth is one free of any modern medical intervention. Their flimsy argument is that the more we intervene in birth, the unsafer it gets. But, but, everyone I know who had dangerous complications had lots of interventions! There’s got to be a connection. So, if I avoid all interventions, nothing will go wrong. Right? Yeah. And walking up to an operating table and hopping on so a stranger can slice open your abdomen is not a rational choice to the ancient part of your brain. Or holding your child down so someone can give it a painful injection. I wonder how many anti-vaxers would come around if they got rid of needles somehow. Agreed, but what I have problem with are not people afraid of hospitals, it is the con artists lay midwives who will take full advantage of such individuals. I have a problem with entire NCB industry which is built on manipulating rational people based on their irrational fears during the period in life when they are at their most vulnerable – pregnancy and childbirth. The odd thing is, I _love_ hospitals. I don’t go to them unless there’s something going on that makes me need them, and knowing that they are so full of knowledge and expertise to deal with what’s going on – it’s very soothing. And it feels empowering to me. I’ve taken a step to make my situation better. I couldn’t wait for the surgery to plate my collarbone break. Debilitating pain and a severe reduction in a range of motion turned into me doing things I really shouldn’t have been doing, pain-free, less than a week after the surgery. Why wouldn’t I want an effective and safe intervention? Since my mom is an ER nurse, I spent quite a bit of time in my childhood and teen years hanging out in hospitals; I was a candystriper one summer as well. It always surprises me when I meet or talk to people who are afraid of hospitals–I understand it intellectually, but to me it’s always been a place where much fun is had (some of the antics of the staff on slow nights was hysterically funny) and generally people walk out in much better shape than they came in. Yes! The dark sense of humour makes me giggle every time. I was walking our dogs recently and a police officer came over to say hi to the nice doggies. He remarked on their size compared to mine, I unthinkingly answered “That’s why I have them in Halties. If you control the head, you control the whole body.” He went from deadpan to perky and said “Oh! That’s what we do with people!” and we both laughed. Yeah. The hospital I delivered at was absolutely fine. No complaints about it on my part. Yet when I interviewed for a job there (completely different department) I left feeling relieved that I didn’t get the job because I didn’t want to have to walk into that building every day. Some things you just can’t talk your brainstem out of. What was the disinfectant/chemical used that gave hospitals their characteristic smell back then – circa 50’s and 60’s? I swear it “smelled” like a hypodermic injection. I still get the Willies at the mere recollection of that odor. yugaya – is there a source for that graph? I’m particularly interested in the data past 1970 or so. One thing that you can often find in plots like this is that they extend exponentially a long way past where they appear to be not changing. If you look at this as an exponential decay, from 1940 through about 1980, you can see that the mortality rate is cut in half about every 5 years. You can always cut the rate in half, but the effect by cutting from 10 to 5 is not nearly as dramatic as cutting from 600 to 300. Definitely, as long as we have major racial (and regional!) disparities on any health outcome, we have not reached an irreducible minimum. There is a measles epidemic now; not because of racial or regional disparities, but because of uncontrolled immigration. Huh, it looks the rate goes up a bit during a period in the first quarter of the twentieth century before beginning a dramatic decline. Let’s obsess over that upward spike. Keep in mind they were measuring every 5 years rather than annually, so the spike isn’t exactly what it looks like. It’s ONE elevated measurement rather than a series of them. I’m still curious, however. I suspect it may have something to do with WWII, since the dates seem to correspond. Shortage of doctors or medicine, perhaps, or difficulties with transportation or something? Just a guess, really, but I wonder. Sorry, I meant WWI, obviously. My finger stuttered. Wasn’t there a flu epidemic in there too? And the Great Depression too? Nope, the timing does not match the Depression. That little peak is 1920, and the Depression didn’t even begin until 1929. The ugliest period was right around Roosevelt’s election in 1932. Roosevelt’s reforms did not entirely restart the economy, but they sure kept a lot of people fed. Obviously, there was a major drop in the birth rate during the early 30’s. Could it be caused by a spike in birth rates after the end of WW1? Yes, and the Spanish Flu Epidemic (1919 I think) killed a whole lot of mothers and babies. If you were pregnant and got the flu, you were screwed. That is almost certainly the reason for the spike. The flu killed from 3 to 5 percent of the world population. I like the comparison to the death rate of prisoners on death row in the US. So maternal mortality in the developed world is on the order of 1 in 10,000, right, with most of those deaths either on the day of birth or very shortly thereafter? So the daily risk of having a baby is almost as bad as the daily risk of being 80 years old. I wonder how that equation extrapolates down to the “state of nature” without medical care. Oh, wait, for maternal mortality, I should probably compare to death rate graphs adjusted for women only. And women’s life expectancy becomes notably greater in old age. Have I mentioned I love actuaries? Because I do, a lot. I believe insurance coverage for midwives is the best thing that could possibly happen to them, because actuaries would require them to be responsible or get kicked off the policy. I love actuaries the profession, by the most unpleasant, control freak ex of mine was an actuarial student (since I met my husband when I was 19 all my exes were students when we dated). This was the guy that my boat (I was a cox for the men’s boat club in uni at the time) broke up with for me, because he was such bad news. 8 simultaneous texts “She’s not seeing you again. Don’t call her.” Then they bought me drinks, told me what they had done and told me I could do better. Cox for the men’s club and suddenly you have 8 brothers. As a wife, daughter, stepdaughter and soon to be sister of actuaries I have to say they aren’t all scary control freaks. Although, only my sister has been an actuarial student. The rest came to it after their original degrees (maths and physics). Oh I’m sure it was just him. He wanted a profession where he could calculate the risks of everything and act accordingly. When he decided what to do on our first date based on “what do girls like in a first date” cross referenced with guidebooks and reviews of local businesses… It should have been a warning. Apparently the risk of annoying 8 very large men was quite high. This is great. It is a question I have wondered about a lot. I have thought before, who is more likely to die? A baby at chidbirth? Or a person on their 100th birthday? The results here say that, in the UK, it is the person on their 100th birthday. But in the US? It’s the baby. At the rate it is increasing, it looks for the US they will match up at about 105 or so. Amazing. What a great way to show the risk. Birth is as RISKY as life gets. Birth is riskier than most of the rest of the life is. I don’t know why that isn’t plainer to more people. Maybe it’s not warm and fuzzy enough? But if you just think about what’s going on during labor and delivery, how easy it is for a baby to be deprived of oxygen in any number of ways, it’s a testament to modern medicine that more babies don’t die during birth. And why, absent those tools, more babies DO die (i.e. out of hospital births). It boggles my mind that that isn’t more evident. Since my First Aid course – where facilitating oxygen access was one of the constantly practiced topic – I began to really appreciate the risk of NCB for babies.